Guardian Maritime Limited is delighted to announce that its GUARDIAN™ anti-piracy barrier has been awarded the prestigious Horners Award for Plastics Design and Innovation. The Horners Award is run jointly with the British Plastics Federation (BPF) and the Worshipful Company Of Horners (an ancient guild and livery company of the City of London) and is awarded for innovation in plastics design and manufacture, or in the processing of plastics. The award is believed to be the longest established Design Award for Plastics in the world, dating back to the first competition in 1947. 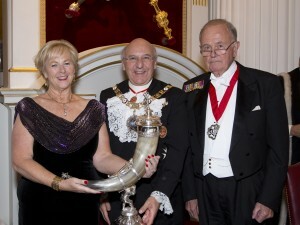 The award was presented in a glittering ceremony held at Mansion House, by Guest of Honour Alderman Sir Michael Bear who acted as Lord Mayor Locum Tenens.